Climate change is too often misunderstood to be simply an environmental issue, rather than a human issue. For our children and grandchildren, climate change is an issue of public health, economics, global security and social equity. This human side of climate change is explained in a new Google Earth tour narrated by former U.N. Secretary General Kofi Annan. Within these stories, you’ll find data and tools to explore this topic in more depth, and meet some of the people who are actively working on managing the risks of climate variability and change. We encourage you to take the tour to learn more about these human issues and the inspiring work of groups like the Alliance for a Green Revolution in Africa (AGRA) that are helping farmers cope with climate change. We hope this video will serve as a useful tool as educators help students around the world understand the complexity of this issue. This is the latest in our series of climate change tours that we’re releasing leading up to the global U.N. Framework Convention on Climate Change (COP16) talks in Cancun, Mexico this week. As part of the Google Earth for Educators Community, we’ve also created a special Climate Change Educators Resources page that teachers can use in their classrooms. 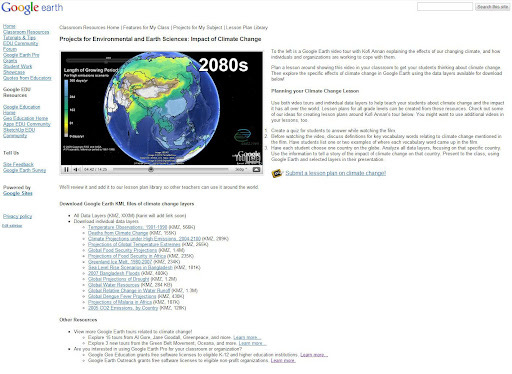 Here, teachers can find the tools they need to create lesson plans about climate change, including all the individual Google Earth KML layers available for download. Teachers and students can overlay multiple data layers that help illustrate climate change, and discuss and analyze them as part of K-12 and higher education curriculum. We’re also looking for lessons plans for any school grade that use this narrated tour or these Google Earth KML layers, so if you’re a teacher or instructor, please submit your lesson plan for review now. Visit google.com/landing/cop16/climatetours.html or the Climate Change Educators Resources page to learn more about climate change today.